The country’s Consumer Price Index (CPI) in September went up by 1.31 percent over the previous month, the highest level for September of any year since 2000. According to the General Statistics Office, the September CPI rose 8.92 percent over September 2009, increasing between 0.34-12.02 percent in 10 out of 11 groups of commodities. The most significant increase was seen in educational products and services, generating 12.02 percent, followed by housing and construction materials, up 1.08 percent. Meanwhile, transport posted an increase of 0.91 percent, with restaurants and related services, up 0.79 percent. Commodities and other services saw a 0.57 percent increase, while entertainment and tourism services were up by 0.48 percent and drinks and tobacco up 0.44 percent. The prices of medicines and medical services rose by 0.35 percent. Slight increases were seen in prices of garment and textiles, headwear and footwear, up by 0.34 percent, and household utensils and appliances, up 0.34 percent. However, prices of post and telecoms continued to decrease, down by 0.07 percent. Experts said the record increase of September CPI was due to many impacts, especially the increased prices of educational products at the beginning of the 2010-2011 school year. In addition, the prices of many materials and essential commodities on world markets saw large increases, and the exchange rate between the Vietnamese dong and the US dollar was adjusted as the dollar strengthened. The price of gas in September rose by nearly 6 percent or 14,000 VND per 12kg cylinder over August. In mid-September, the price of steel in the south was up 300,000 VND per tonne after it had increased five times in August. Sharp increases in food and restaurant-related services, especially prices of rice - increasing 2.32 percent - markedly contributed to CPI rise. Moreover, people had a long holiday for National Day and the Mid-Autumn festival, and with both occurring in September, this increased demand for tourism, entertainment and shopping. 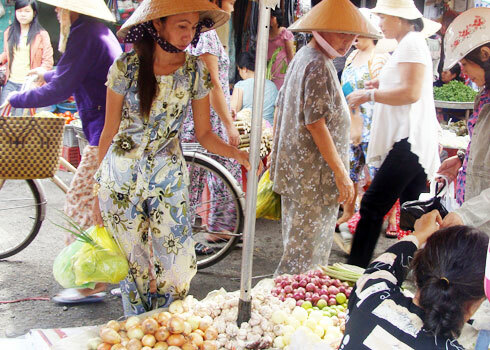 The CPI of the two economic hubs, Hanoi and Ho Chi Minh City increased nearly 1 percent against August - despite measures to stabilize eight essential goods - and exerted a dramatic impact on the country’s CPI. In September, prices of gold and US dollars on the black market saw sharp increases. Gold prices went up by 3.58 percent from August, and by 34.35 percent against September 2009. Meanwhile, the US dollar price rose 1.61 percent against August and 7.35 percent against September 2009. However, experts have warned that the goal of maintaining inflation at 8 percent is not easy as the country will continue to face complicated impacts, including instability of the world economy, as well as epidemics and natural disasters. In addition, CPI regularly increases in the fourth quarter of every year. Ministries, sectors and localities are urged to closely control prices of goods and services with support from the government and obey price registration and declaration instructions. Experts also warned that the fourth quarter was the time for payment of imports of commodities and materials for production, and it is necessary to have flexible measures on exchange and bank interest rates to ease difficulties for enterprises in order to ensure the balance between demand and supply, and effectively curb price surges.